Hey Missoulians, do you remember Tipu’s? I do. I haven’t had samosas like that before or since. Sure, the Good Food Store comes very close, but it’s just not the same. And the date raisin chutney? Forget about it! Unfortunately, when Tipu’s was still around, I wasn’t brave enough to venture farther than the samosas. I had very limited tastes, and, everything else kind of looked weird. I’m sorry! I didn’t know any better! Now that I’ve seen the light, there’s few places in Missoula for a girl to get decent Indian food. Internet to the rescue! 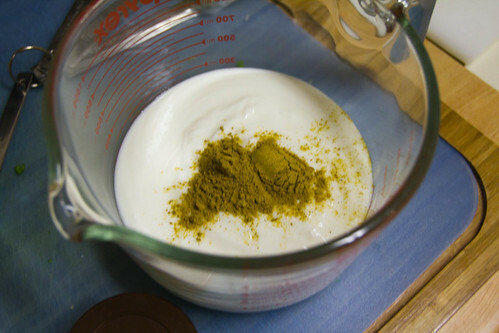 I liked this recipe because it had, of all things, yogurt. I had mustard powder, not mustard seed, and when I started dicing my brand new, perfectly good looking onion, it was moldy! Sad day. However, I’d had a little wedge of onion leftover, and some green onions that were needing to be used up, and it turned out totally fine. 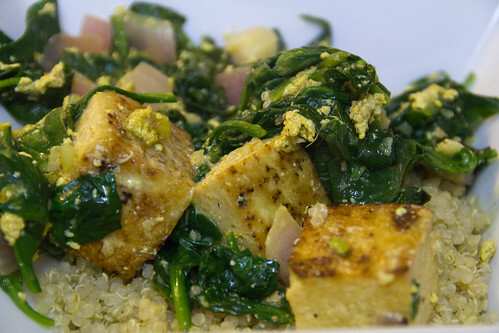 I started with sesame oil, because I thought it would give the tofu more flavor than just regular oil. 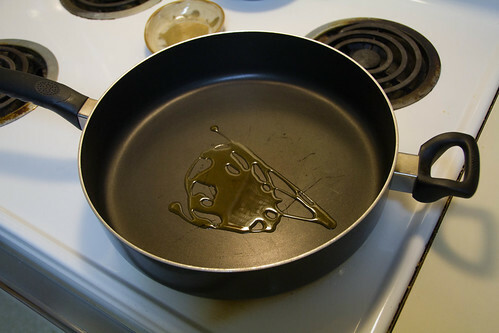 When the oil was warm, I threw the pressed and drained tofu into the pan. 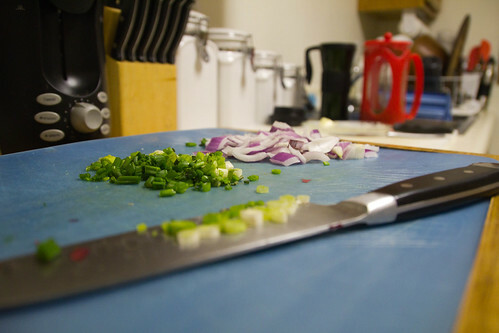 Meanwhile, I chopped the onions I had. The tofu browned nicely. It’s hard to remember not to rush the browning process. The longer it cooks, the firmer the outer edge will be, and the nicer the texture. 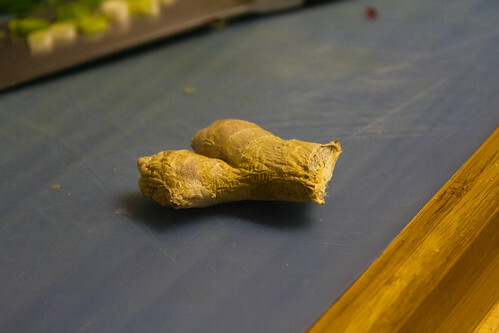 This doesn’t look like something that humans should eat, but the flavor and aroma ginger produces is incredible! 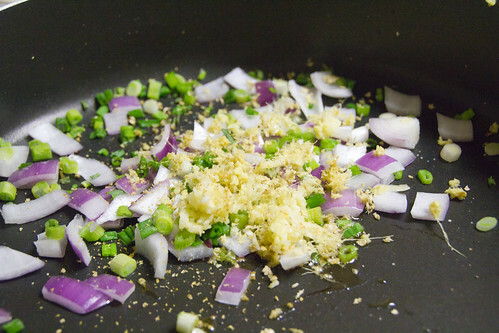 After the tofu was browned on all sides, I set it aside and started heating the onions, garlic, ginger, and about 1/2 teaspoon of mustard powder. While the vegetables sauteed, I mixed the yogurt with curry powder, cumin and salt. Here is where a little speed of hand is helpful. Spinach wilts very quickly, but it starts out quite large. You have to add one batch at a time, stir, and then add the next before the previous batch becomes too wilted. 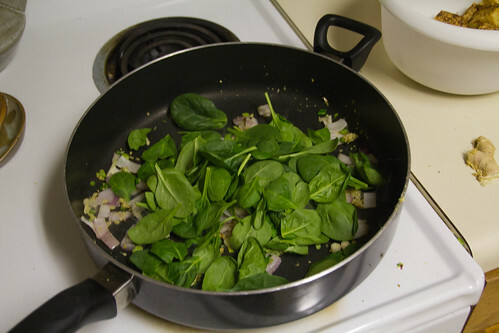 You’ll start out with so much spinach, but by the end you’ll wonder where it all went. 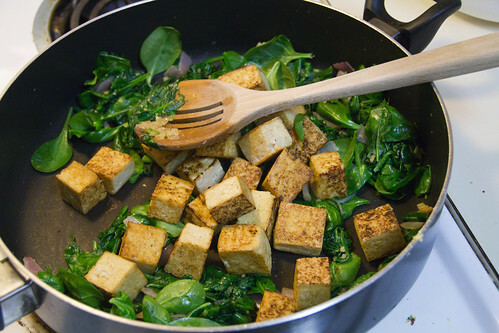 As the last of the spinach goes in, throw the cooked tofu back in the pan to start heating up. When the tofu is warm, add the yogurt and heat through. 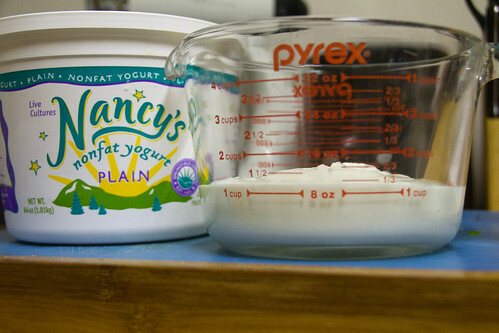 Something odd happens to the yogurt a few seconds after it hits the warm pan. It starts to get quite watery and runny. The trick is to keep stirring and only keep it on the heat until it’s warm. You don’t want to lose all the liquid. The recipe suggests serving this over Basmati rice, which would be lovely. I used quinoa, and it was the perfect vessel to add bulk without detracting from the flavors. 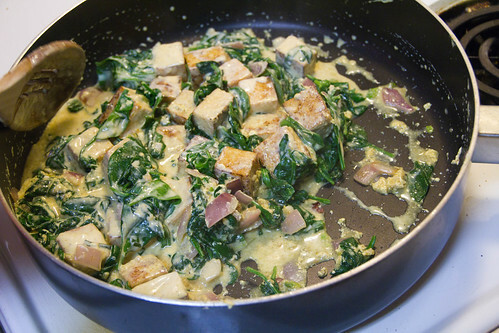 My only problem with this method is that while the spinach/onion mixture is the perfect balance of exotic flavors and textures, the tofu leaves a little to be desired. It was very bland, and by the end, I found myself picking through and leaving out the tofu. 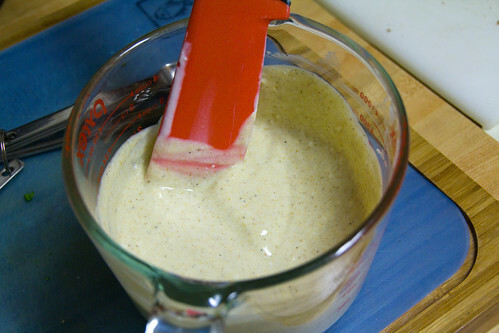 I don’t see why you couldn’t marinate it in the yogurt for awhile. 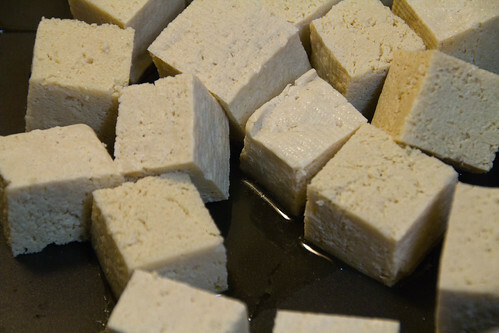 I would cook the tofu, mix the yogurt, and then put the tofu in the yogurt after it had cooled off. 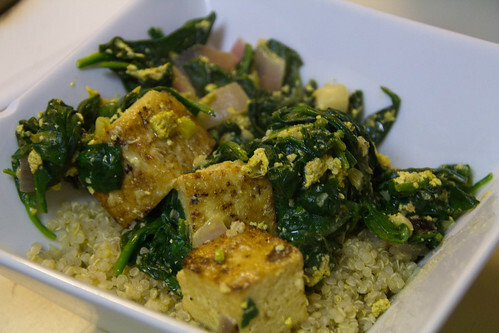 Then, only after the tofu is sitting in the yogurt, would I start to prepare everything else. This is the type of dish to serve someone who thinks they don’t like Indian food. It has familiar ingredients for more Western tastes, and it’s not spicy for those who think that Indian food will burn your taste buds off. I’m not sure how it survives through the next few days, because we didn’t have any leftovers. It was waaay too good to leave sitting around. Love the site! 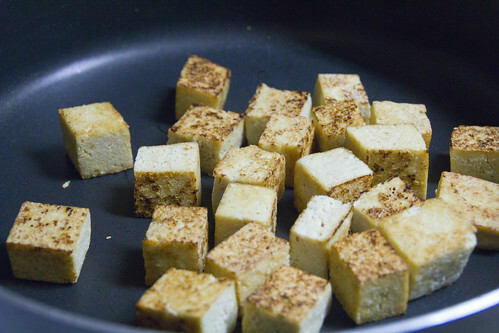 FYI on tofu….if you marinate it in “whatever” before cooking with it, it tastes much better! i/e chicken broth for chicken dishes, meat broth for meat, veggie…..even a curry broth would have been great for this dish! Then it doesn’t taste like a soggy sponge. Thanks! We actually cook tofu quite a bit, but I was following the recipe on this one. I always try it their way the first time, and then make it my way next time.